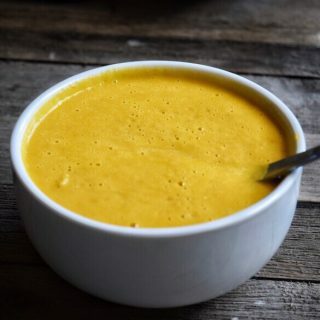 Pumpkin Soup – Healthy and tasty soup with pumpkin, garlic and pepper powder for babies, toddlers, and kids. Pumpkin is a nutritious vegetable, rich in minerals, fiber, and vitamins. 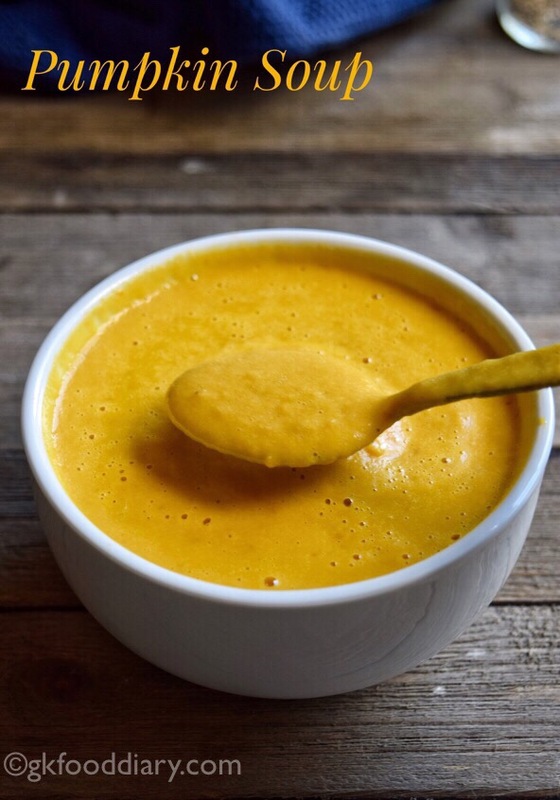 There are many ways pumpkin can be incorporated into babies diet as puree, halwa, kheer, etc. 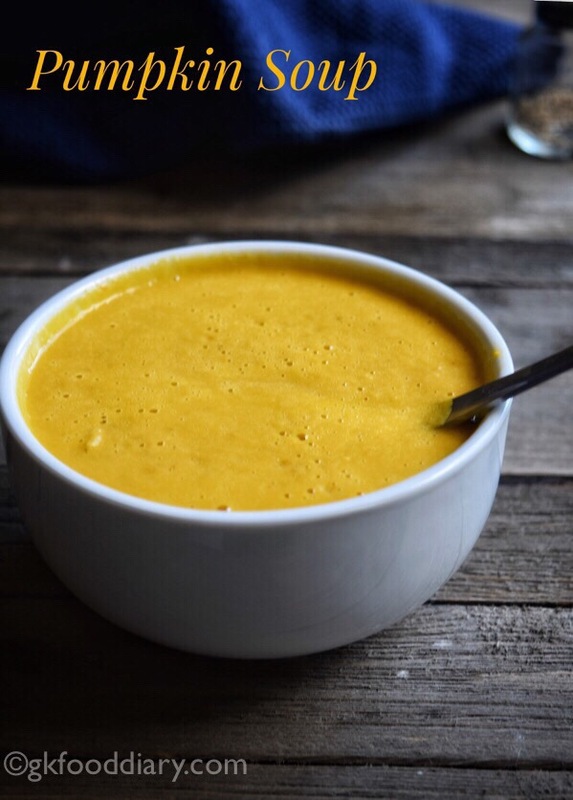 This pumpkin soup is one of the easiest ways to include pumpkin and can be given to babies from 8 months. Check out other pumpkin recipes for babies, toddlers, and Kids. 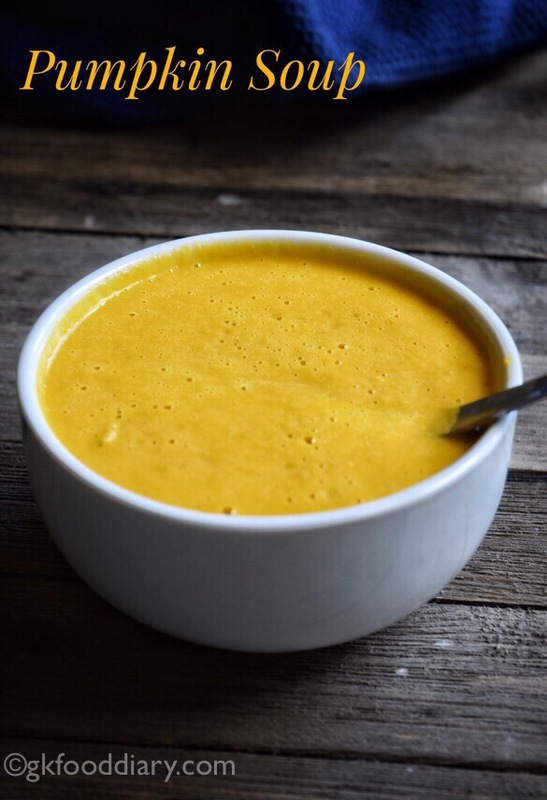 Pumpkin Soup - Easy and healthy soup for babies and kids with pumpkin & mild spices. 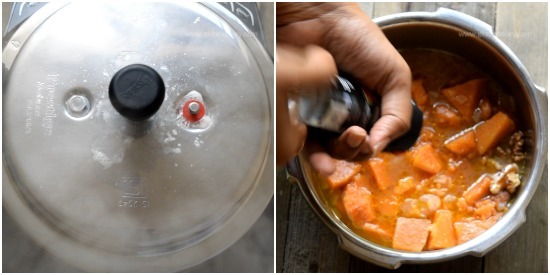 Wash, peel and chop pumpkin into cubes. Finely chop onions & garlic. Keep all the other ingredients ready. In a pressure cooker, heat a tbsp of oil and add garlic. Saute them for few seconds. Now add onions. Fry them nicely until translucent. Now add in cubed pumpkin. Give a quick stir. Then add in walnuts and almonds and mix well. Add ¾ cup of water. Sprinkle required salt. Pressure cook everything together for two whistles in medium low flame. Once the pressure is released, open the cooker. Add in pepper powder at this stage. Transfer the pressure cooked the pumpkin to a blender with water used for cooking. Grind it to a smooth puree. Serve the soup warm! 1. 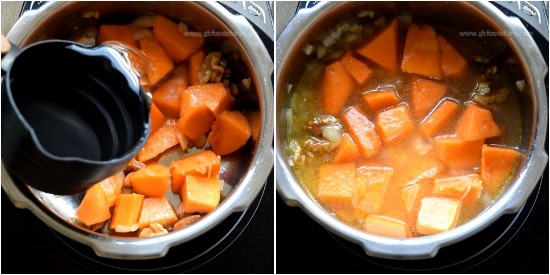 Wash, peel and chop pumpkin into cubes. Finely chop onions & garlic. Keep all the other ingredients ready. 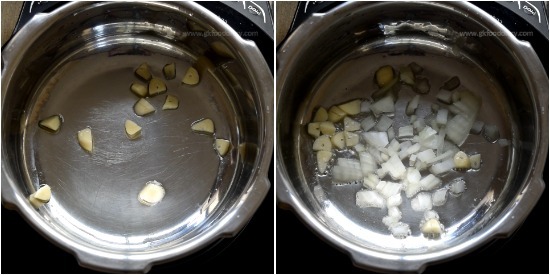 In a pressure cooker, heat a tbsp of oil and add garlic. Saute them for few seconds. Now add onions. Fry them nicely until translucent. 2. Now add in cubed pumpkin. Give a quick stir. 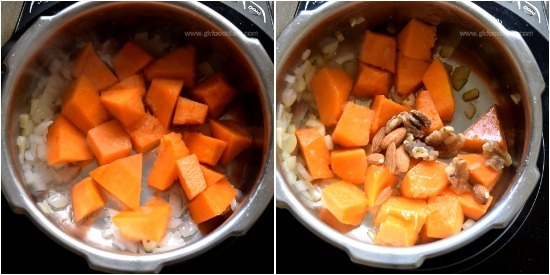 Then add in walnuts and almonds and mix well. 3. Add 3/4 cup of water. Sprinkle required salt. 4. Pressure cook everything together for two whistles in medium low flame. Once the pressure is released, open the cooker. Add in pepper powder at this stage. 5. Transfer the pressure cooked the pumpkin to a blender with water used for cooking. 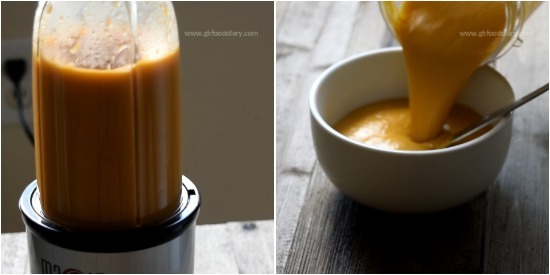 Grind it to a smooth puree. Serve the soup warm! 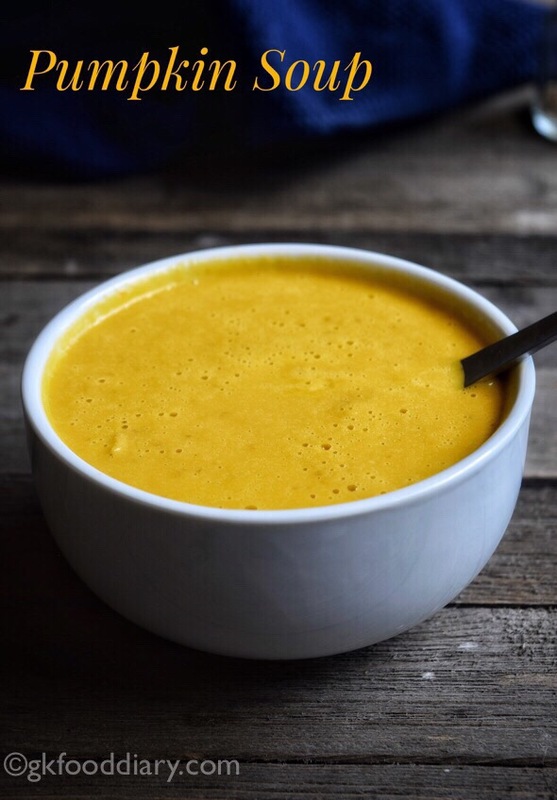 Healthy pumpkin soup is ready!